What looks to be the back of an upcoming iPad edition leaked out, indicating a slightly altered rear camera placement. Now there are rumors about an upcoming high-res iPad Mini 2, as well as a thinner iPad 5 with smaller bezel, and each of those might look like the leaked prototype above, at least from the rear. Meanwhile, cases for the alleged iPad 5 have shown up, confirming the rumors for a 15% thinner and a third lighter next generation Apple tablet. The cases also reiterate the camera placement changes we actually see on the supposed prerelease unit, and the additional small opening indicates we might indeed have additional mic on the back for some spatial sound recording. The other rumored specs are an A7 processor, 8 MP camera and an expected price of $500 for the 16 GB version as usual. So now you're back to being an iOS fan? Bring on the best of the best. 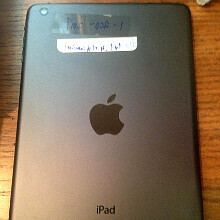 I gotta have this puppy, I'm ready to retire my iPad 3.
you really are a blinded fan of a specific brand...! Actually, he has made it quite clear that he is a fan of both platforms. He uses both platforms and his posts about both are fair IMO. Sure you not talking about yourself? Nope, pretty sure, i have had android since day one and today still android on S4, but after IOS 7 (borrowing) important features from android i will get either the Iphone 5s or Iphone 6, since i think its about time to try a new platform, i am not a fan. i believe in one thing. Competition makes the market better for me as a customer. You and me both. My iPad 3 has served me well but I think I am going to opt for the mini this time if it comes with the Retina Display. I definitely enjoy the smaller form factor. I loved my Mini, but I hated the screen. A faster Retina Mini would be a dream, and likely a punch to the throat for the competition. A non-Retina Mini with iPad 2 internals is the second best-selling tablet ever, so that has to make everyone else slightly uneasy.